That's what this blog post would be called if it were made into a movie... of course you'd have to watch the first, second and third installation before you could watch this one. Otherwise you'd totally have no idea what was going on with the plot. But the good thing about sequels is that they always add in some sort of surprise element to keep the story spicy. In this case, we have a surprise walk on role from my Wreck This Journal's clean cut, long lost brother. I recently purchased a brand new WTJ as a gift to one of my artist friends. I couldn't help but take some pictures comparing the two books. It's hard to believe that they are the same.. actually, the new one has more pages inside than mine does. Kinda hard to tell from the pictures, I know. Keri Smith's Wreck This Journal - Before and After from the side. Here's a picture comparing the thickness of a new Wreck this Journal compared to my totally wrecked copy. This is where their differences become real obvious. Since I began working on it, this book has doubled in size. The main thing that has happened to the journal lately is that it is completely falling apart! The covers are peeling off. The book itself has also breaking up into two equal halves. I think the only thing holding the two pieces together are some little threads of paper. I'm still using my home-made table of contents page... I've began crossing out page numbers that are 100% complete. It seems like I still have a lot of pages left, but I try to keep in mind that a lot of those pages are very close to being finished. Makes things seem less daunting if I think about it that way, at least! "Press leaves and other found things"
Some may remember this page from previous blog posts, it is covered in rose petals. Like the changing of the seasons, the petals have almost all completely transformed from a vibrant red color to dull brown. Still, this has to be one of my most unexpectedly favorite pages in my journal. "Scribble Wildly with Reckless Abandon" So I drew a portrait of Lana Del Rey... I'm going through a phase, I think! "Do some rubbings with a pencil" I think I waited too long to do this page. By the time I got to doing the rubbings, the paper was so worn down by being so wrecked that any of the rubbings that were there barely showed up! So, naturally, I drew a big fat fly's head over all of the mistakes. Kind of a weird page- "Chew on This"... The freaky lips and tongue are loosely based off the infamous "Open up and say Ahh!" Poison album cover. Also, suddenly maggots! "Tongue Painting" Okay, I kind of went crazy with this page. It all started with some sticky transparency paper and a sharpie. I drew the strange dancing figure ladies and layered them on. After that, more and more colored pencils and markers. And some lips. And some Eskimos. Like I said, this page went crazy. "Tie a String and Swing Wildly" I admit that I never did work up the bravery to tie a string around my journal and swing it against things. However I'm sure it's been thrown and abused enough to make up for that teeny tiny factoid. Since my last update on this page, I've added color...it kind of reminds me of some sort of weird jungle now. Out of everything that has been inflicted on this journal, time has effected it the most. This page is the ultimate tattoo cover up- I drew over the original drawing on this "Ugly Drawing" WTJ page because I have since let go of those frustrations and replaced it with two pieces of poop. "Pretend you're doodling while on the phone"
There are a lot of pages like this in my book- half finished. 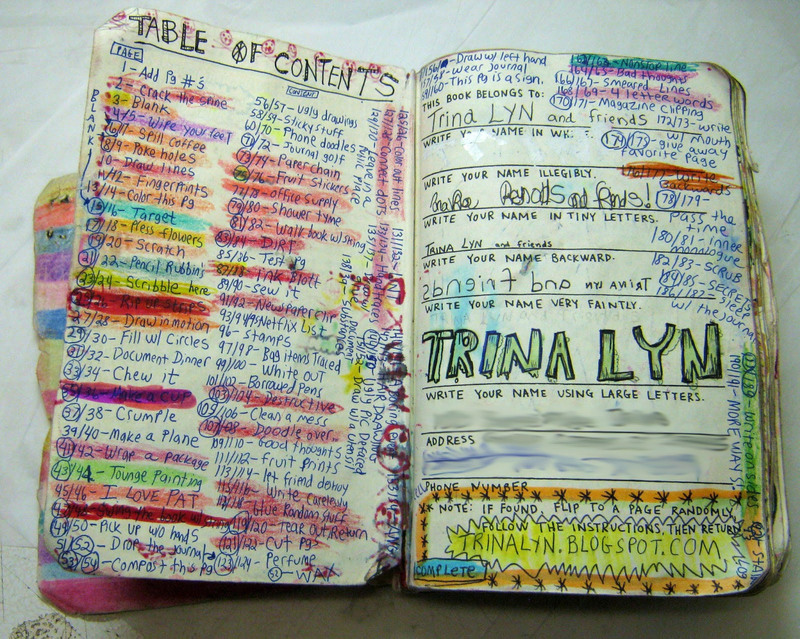 I think the biggest challenge of the Wreck This Journal would definitely have to be commitment. 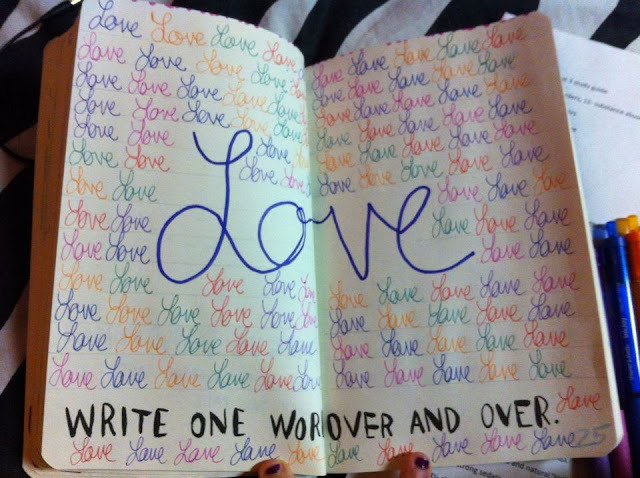 To fill each page back and front is no easy task... it's almost like you have to rewrite the book entirely. But there's no time limit, so I feel encouraged to work only when I want to. And sometimes that means I sit my journal down for long periods of time before I get back into it again. "Test This Page" For Science, of course. Still haven't done anything with this page besides color it, but I have to note it is the "last thread" keeping this book from splitting apart. "Sew This Page" seems more like a command than an instruction now! "Wrap something with this page" - Instead of wrapping up something in this page (which would be weird because the paper is tiny) I went ahead and made it into a cool bat person themed pocket holder. The pocket contains a napkin from Medieval Times, personal notes, stickers and other random things. "Cover This Page with white things" - A very interesting but tough challenge... it's like having to draw a picture entirely with a white crayon! But somehow, it works. I love how everything is "white" but all in a different shade. "Make a Mess. Clean it up." A page that I was shying away from until a random person finally marked it up with their drawing of a toilet, scribbling on the rest of the page for flair. For some reason the scribbles reminded me of tangled threads, so I glued in a big ball of thread trimmings that I snipped off of my Frankenquilt. I was feeling extra reflective that day so I entangled little strips of paper in the threads that are tiny secret "personal messes." I work on those messes one pile at a time. One day, I was given all of these really weird / old encouraging Disney stickers, so I thought the best way to utilize these guys would be on the good thoughts page. Because Disney characters are always so overwhelmingly positive all the time. I didn't think the page was quite finished until I drew all over it with some markers and colored pencils, though. It took me a long time to fill up this page! I thought it would be a quick and easy one, but I ended up going back on several different occasions to "write carelessly." It became kind of addicting after a while, though. You get an overwhelming sense of freedom from writing random trains of thought. "Cut Through Several Layers" I didn't like the job I did the slack job I did the first time, so I got my X-Acto blade and took it to the extreme. "Infuse this Page with a smell" - The nose approved of the sweet perfume scent that once permeated off this page... if you sniff really hard, you can still smell a little hint of it! I like the way the cut diamonds have created an interesting pattern on this page and still somehow managed to not cut any of the words or drawing off. "Create a Nonstop Line" - Challenge accepted. I created a really complex nonstop maze and colored in the sides with Sharpie marker. "A Space for Negative Comments"- This is a collaborative drawing between me and my boyfriend. He drew the strange spider guy and I colored him in... then, accidentally bled the nonstop line maze all over it. Fortunately, the maze kind of fit around the drawing in an interesting manner. Very surreal little drawing. By the way, if you recall from my very first Wreck This Journal post, my friend Tiffany had gotten into wrecking spirit as well. Tiff has been super busy with being awesome at school but between the craziness of finals and college life she has still managed to find time for her journal. She worked on a few new pages that I'd like to share! "Throw Something at the Journal" I could never quite figure out what I should use as a "ball dipped in paint" without ruining a perfectly good ball but it seems that Tiff has figured it out. 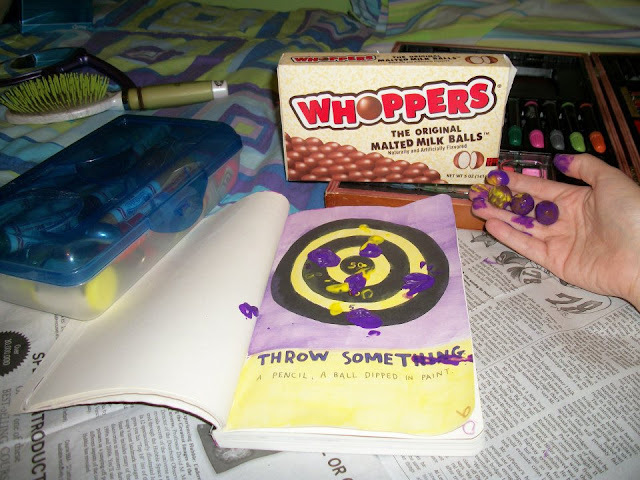 Whoppers make perfect disposable paint covered ball missiles! "Fill This Page with Circles" - I love all the googly eyes, so cute! I also like how she utilized round containers of all different sizes as colorful paint rings. "Page for Four Letter Words"
"Add your own Page Numbers"
Two new additional pages to Tiffany's WTJ. 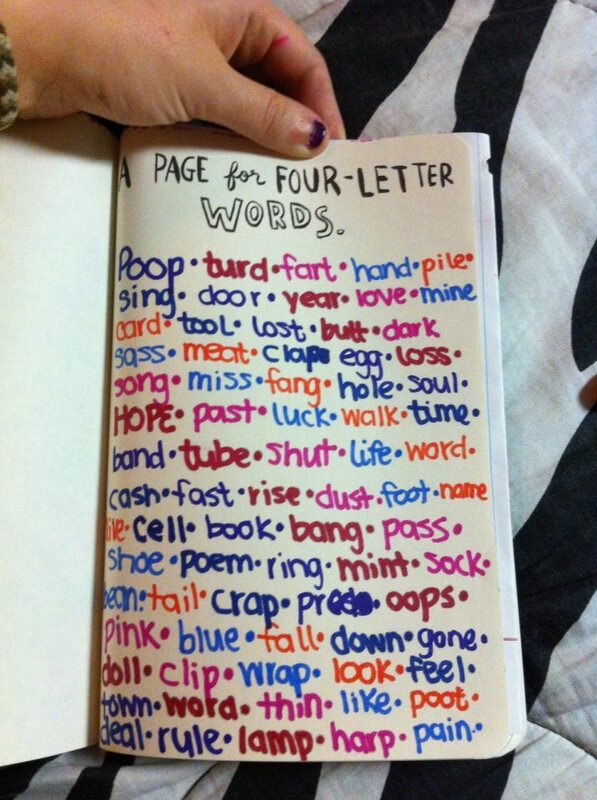 I just want to point out her first four letter words that came to mind were "Poop" "Turd" and "Fart"... I like your style Tiff, very "artsy fartsy" of you Lol. Probably my favorite page by Tiffany so far, "Write One Word Over and Over." It's so colorful and nice looking! 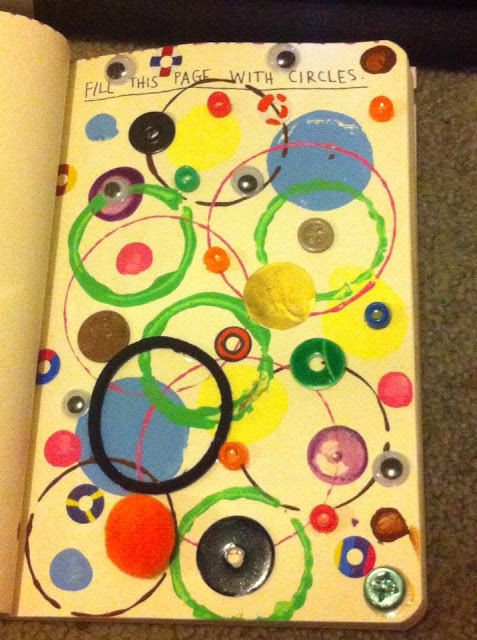 The most important thing to remember about working in a Wreck this Journal is that you just have to keep with it. Even if you put the journal down for a whole year or something, that doesn't mean it's no good anymore and that you aren't allowed to work on it again. There aren't any rules..The book is a symbol for being able to live your life how you want to! In conclusion, I guess I have to say that I can't say exactly how long I'll be working on my Wreck This Journal before I consider it finished. I know it seems a little extreme to try to fill up all the pages, but seriously, how many people have actually been able to complete this challenge? It would be an honor to be a part of that club, so expect more updates on new finished pages from my WTJ in the future. I'm in it for the long haul. The only thing that can stop me is the book itself... it's falling apart at an accelerated rate at this point! Firstly, does anyone have any suggestions on how I can put this book back together again? I was going to try to sew it but I'm not sure, especially if there's another option that would be more heavy duty and long term. Also, I invite anyone that has done a few pages of their WTJ to definitely share their work! I love seeing fresh inspiration. Just drop off a link to your blog or directly to the images in the comments section. It's very interesting to see how people all interpret the pages differently and also the rationale behind their process. As always, happy wrecking everyone! I stumbled upon this blog post entirely by accident, but I love my Wreck This Journal, I've had it for years! I wrote a table of contents in on mine, too, to keep track of what I had and hadn't done, but then I stopped updating it so now all of my undone pages are bookmarked. :) I ended up completely rebinding mine, I made a new collage cover for it and sewed through all of the pages with brightly colored thread. Your journal is incredible! I love seeing how people interpret pages differently, but you have gone above and beyond and created a journal entirely your own (most people's I've seen online have copied other ideas, not so cool). Your artistic style is also amazing! Wow! 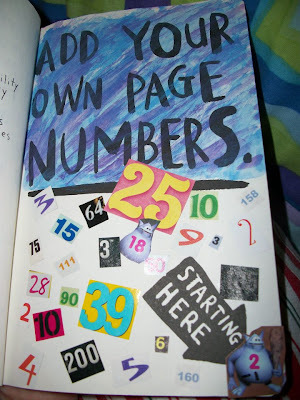 I love seeing what you did to your journal! And might I say quite the best use for Whoppers? I tried them once when visiting the US and could not believe that is what chocolate is meant to taste like in the States. Perhaps I got a stale bag?